We at For Harriet are still saddened by news of teenager Trayvon Martin’s shooting by neighborhood watch captain, George Zimmerman and is seeking answers and justice, along with everyone else and is proposing a “Blog-in” this coming Friday. The facts seem clear: Trayvon Martin, a 17-year-old Black boy, was shot and killed a little more than two weeks ago in his father’s gated community in Florida, by 28-year-old White neighborhood watch captain George Zimmerman, as he returned home in the rain, cloaked in a hooded sweatshirt, from the store… an iced-tea and candy in-tow. Zimmerman, who was armed and thought Martin looked “suspicious”, had been given explicit instructions by a police dispatcher, not to leave his vehicle and to wait for a police cruiser to arrive, after he placed a call to a non-emergency number. Zimmerman (also cloaked in a red hooded sweatshirt) opined; “these a**holes always get away”, and decided to exit his vehicle and pursue Martin on foot between two rows of townhouses, 70 yards from where Trayvon had been staying with his father, that weekend. Zimmerman (who outweighs Martin by about 100 pounds) engaged Martin in a fight, essentially shooting and killing the 17-year-old and claimed “self-defense.” George Zimmerman has a reported history of aggressive behavior, Trayvon Martin doesn’t. George Zimmerman is still a free man and has yet to be offically charged with the killing… inciting people to ask, WHY? Please join For Harriet for a “Blog-in” Friday, March 16 and express your thoughts about a seemingly senseless killing, and urge your readers to take action. Update 3/19: The blog-in continues. 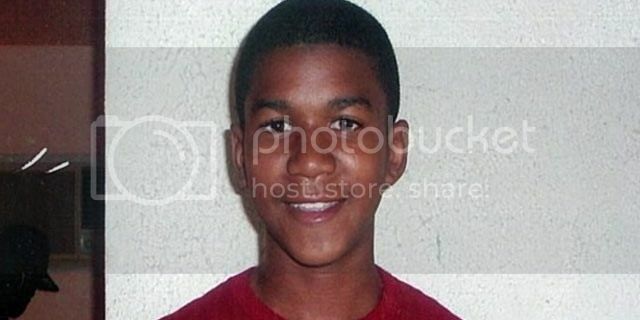 Please spread the word about Trayvon's killing via your blogs and social networks. Mainstream media continues to mismanage the story. It's up to us to tell the truth.